Chris Hedges often speaks at The Global Center for Advanced Studies (GCAS). In Brooklyn at our “Democracy Rising” lectures (Fall 2015) and at our “Democracy Rising— Philadelphia” conference held at The University of Pennsylvania’s art space Slought. Recorded @ Slought at the GCAS Democracy Rising—Philadelphia Conference (June 2016). 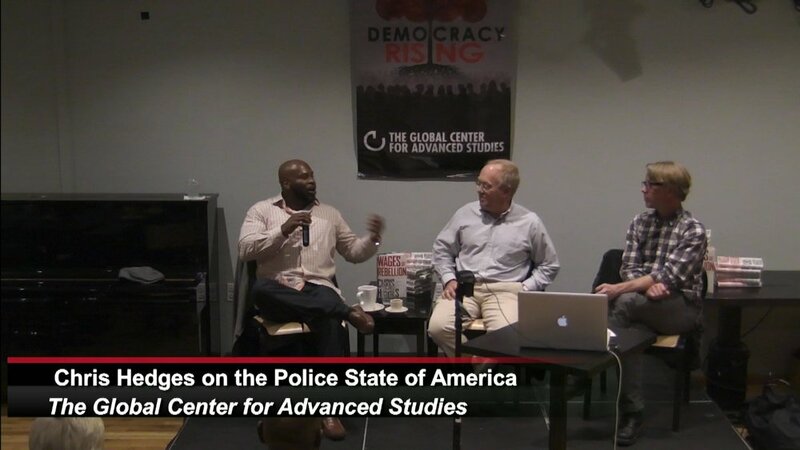 Watch Boris Franklin & Chris Hedges speak on “The Police State of America” via this Link. Christopher Lynn Hedges (born September 18, 1956) is an American journalist, Presbyterian minister, and visiting Princeton University lecturer. His books include War Is a Force That Gives Us Meaning(2002), a finalist for the National Book Critics Circle Award for Nonfiction; Empire of Illusion: The End of Literacy and the Triumph of Spectacle (2009); Death of the Liberal Class (2010); Days of Destruction, Days of Revolt (2012), written with cartoonist Joe Sacco, which was a New York Times best-seller; Wages of Rebellion: The Moral Imperative of Revolt (2015); and his most recent America: The Farewell Tour (2018). Hedges is a columnist for the progressive news and commentary website Truthdig. He is also a host for the television program On Contact on RT. Hedges spent nearly two decades as a foreign correspondent in Central America, West Asia, Africa, the Middle East, and the Balkans. He has reported from more than fifty countries, and has worked for The Christian Science Monitor, NPR, Dallas Morning News, and The New York Times, where he was a foreign correspondent for fifteen years (1990–2005). In 2001, Hedges contributed to The New York Times staff entry that received the 2002 Pulitzer Prize for Explanatory Reporting for the paper's coverage of global terrorism. He also received the Amnesty International Global Award for Human Rights Journalism in 2002. He has taught at Columbia University, New York University, the University of Toronto and Princeton University, where he is a visiting lecturer in African American studies. Hedges has taught college credit courses for several years in New Jersey prisons. He teaches a course through Princeton University in which the class is composed of half prisoners and half Princeton undergraduates. He has described himself as a socialist and more specifically as a Christian anarchist, identifying with Catholic activist Dorothy Day in particular. Chris Hedges @ the GCAS Conference at the University of Pennsylvania 2016.